After fixing up my ragged cuticles and letting my nails breathe over night I succumbed to the call of my nail polish stash. I originally wanted to try a neon splatter manicure over white but the whole straw blowing thing just wasn't working for me. Instead, I opted for a spin on an ombre manicure by doing some diagonal zebra-esque stripes in a purple-yellow gradient. The silver glitter adds a bit more fun to the already wild design. I think it's so tacky and bright and hysterical but I do love it all the same. It's something definitely different from my usual and a refreshing change from all the tribal and florals I've been doing. I used Sally Hansen Whirlwind White as a base for all the nails and various neon Art Club striping polishes for the design. For added detail I used a silver glitter striping polish in random places. This is the last of the manicures from my cruise. Please, please try not to stare at my cuticles too long. They're scary, I am aware. Despite that, I really love this butterfly motif that I've seen around the web. I've done it before with a monarch butterfly colour scheme but I never snapped a photo of it. After replicating the look on my mom, I knew I had to get it on my nails too. Here I layered China Glaze Temptation Carnation over Essie Nice is Nice. On the thumbs and ring fingers I used Essence Purple Magic and another white striping polish for the butterfly wings. Between baking by the pool, hiking around Pompeii and eating my weight in food, there wasn't too much downtime for nail painting, never mind nail care. By the end of the trip my cuticles were crying but they're all better now. Try not to cringe too much in the next photo though! Anyway, without a lot of time to think I went with what I know best. I got to try out one of my new Essence polishes and I'm happy with the overall results! 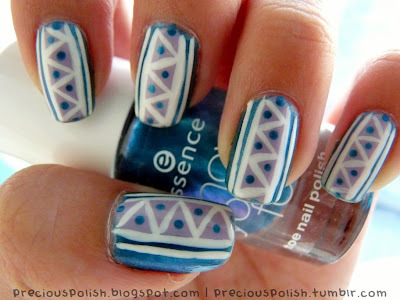 This is Essence Caribbean Sea as a base colour with Essie Nice is Nice and a white striping polish for the tribal. 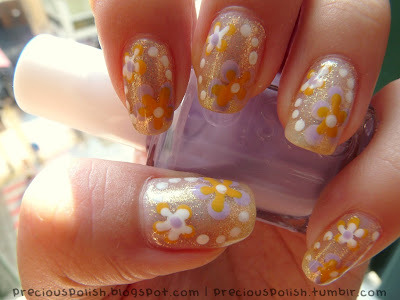 Want to try this design on your own nails? Watch my video tutorial over HERE! This is the first manicure from my vacation. I'm going to apologize in advance for the horrible quality of these vacation manicures. The lighting in all of them was horrible and my camera lens got progressively more dirty. Anyway, here's what I wore in Venice, Italy. I thought that flowers would be foolproof but I was wrong. I should have stopped after the first coat of polish. China Glaze White Cap is way better layered because on its own it becomes a jaundiced yellow-gold foil abomination. Never again. Started with coats of China Glaze White Cap and Essie Nice is Nice and American Apparel Manila for the design.